Introducing JHM Tuning for the B6-A4 with the 3.0L V6!!! To see our tuning in action, feel free to check out the video below. Both of the B6-A4 3.0L cars featured in this video have the JHM ECU Tune along with several other JHM upgrades. 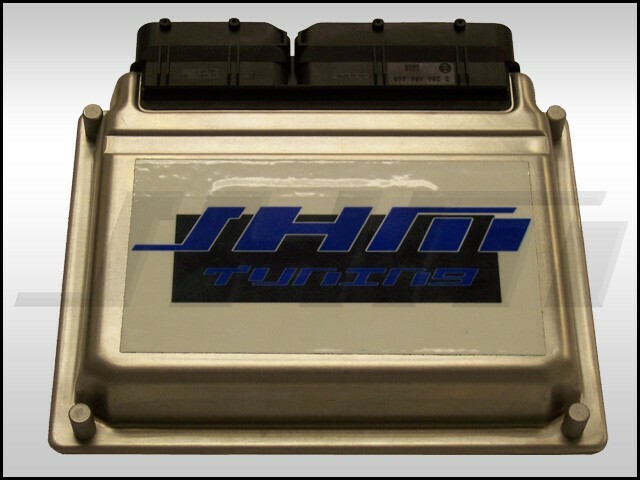 As we stated above, our JHM ECU Tuning you will give you noticeable improvements in the performance of your 3.0L. However, if you add our JHM 2.5" Stainless Steel Downpipes ON TOP of the ECU tuning, it will completely transform the power band of your car. If you are looking to unlock the potential of you 3.0L V6, these 2.5" downpipes are the key. Check them out in the Engine and Performance Section. They are an absolute MUST for anyone looking to get more power out of their car. Our extensive research proved this point time and time again. When we put our 2.5" downpipes on a stock car, the car was impressive and the increased airflow of the downpipes definitely made the car seem a bit more "peppy". However, when we put the downpipes on a car with a JHM B6-A4 3.0L V6 ECU Tune on it, the result was amazing. The combination of the increased airflow from the downpipes and the ability of the JHM ECU Tuning to take advantage of that increased airflow completely transformed the power band of the car. The gains in low-end torque were good but the most impressive power increase can be found in the top-end of the RPM range. With the motor breathing more freely and the addition of our ECU Tuning, the 3.0L just keeps accelerating up top! OPTIONS: When you place your order for JHM Tuning, please specify your year, body type, octane, secondary air injection delete, transmission type, and flashing method by using the drop down boxes below. If you already have a JHM Tuning-Flashing Cable, select "I already have a JHM Tuning-Flashing Cable." **NOTE: This is a proprietary cable manufactured by APR with drivers specific to our Flashing Software so you must make sure that you have a JHM Tuning-Flashing Cable, NOT just a generic USB Vag Com cable. ** After receiving your paid order, we will send you an authorization form which we will use to create your JHM Tuning Flash Browser account and login information. This is the information you will use to access our server and flash your car with the JHM Tuning-Flashing Cable that you already have. DISCLAIMER: JHM is now using proven flashing technology in order to get our tunes on our customers' cars in the quickest and most convenient way possible. You will be installing two separate programs on your computer: VPN software to access our flashing server securely and our JHM Tuning Browser which is the program that writes the JHM Tune onto your car. Both of these programs are highly specific when it comes to configuring your computer to run them properly. While every effort has been made to clearly and completely explain this configuration in our instructions, the customer will ultimately be responsible for removing or disabling their own or third party anti-virus software or firewalls that will block the port required for you to log into our flashing server (see the link to our instructions below to determine whether or not this is something you'll be able to do). Basic technical support provided by JHM to help install these programs on your computer, diagnose programs with your computer, and/or internet connection may be subject to an hourly fee. Additionally, if something happens to your ECU during the flashing process, you should be able to restore it using our software. If you are still unable to make the ECU flash properly, you will be responsible for all costs associated with restoring your ECU and fixing the issue. - JHM Tuning-Flashing Cable (Flash cable length cannot extend beyond 10 ft long unless a powered USB hub is installed in-line. You can download and view the instructions at jhmotorsports.com/downloads/VPN.zip to determine whether or not this is something you would like to do. If you would like to get tuned at our location in Lathrop, CA please give us a call to schedule an appointment! If you'd like to get tuned at a JHM dealer close to your location, you can find one using our Dealer Map by clicking the "Dealers" Tab at the top of this page. You will need to contact your preferred dealer directly and schedule a tuning appointment with them. You shouldn't be charged more than an hours' worth of labor for your JHM Flash. DO NOT SHIP YOUR ECU TO JHM without contacting us first!!! **UPDATE, 10-1-2012:** JHM Flash Tuning technology will overwrite **most** previous tuning on your ECU. If you're already tuned with a poorly performing, "brand-x" ECU tune you don't need to worry about it interfering with the process for becoming JHM Tuned. However, if another company has installed a soldered on board like we used to, you will not be able to flash over that. In these cases, the customer will be responsible for all additional labor charges, shipping costs, etc. required to convert the ECU back to stock to allow it to be flashed. Any previously tuned JHM ECU with a solder on board can be converted back to stock. This will allow the customer to convert to JHM Flash Technology. Previously tuned JHM ECU customers will need to send their ECU to JHM to have it converted to stock and then have the stock ECU installed in their car and tuned via JHM Flash Technology. If you go to a JHM Dealer to have your ECU removed, you will be responsible for all associated labor and shipping costs charged by the dealer. If you plan on flashing your car on your own, you will need to pay for a flashing cable as well. When tuning ECUs from other platforms, we've ran into some issues with ECUs that are already chipped. We have found that other tuning companies sometimes make proprietary changes to your immobilizer chip (a chip for the anti-theft and other things separate from the main ECU chip), thus making the ECU unable to function with a stock chip or a JHM tune. It is an involved process for us to repair your ECU so it can again function with a stock or JHM chip. So please mention in the comments of your order if your ECU already has a tune on it. Please give us all the details about any programs you had installed so we can be prepared for any extra work involved with chipping your ECU. Keep in mind that any extra time we have to spend in tuning a previously chipped ECU will increase the turnaround time and potentially increase the cost of the tuning process itself.